Successful admission professionals understand that developing a connection with a student can greatly increase his or her commitment to the college and improve the likelihood of enrollment. In fact, our studies have demonstrated that 8 in 10 students say the relationship they formed with their chosen college was influential in their decision to enroll. If there is any doubt in your mind about the influence of relationship building in the enrollment process, consider this additional data: The separation between the chosen college and the second choice is wide with regard to the key factors that influence relationship building. For example, 61% of students participating in the national study, “The Relationship Dynamic,” indicated that the statement,“Admission reps were sincere and cared” applied to their chosen college but only 25% said it applied to their second choice college. With reference to the statement, “The college understood me,” 59% said it applied to their first choice school vs. 22% to their second choice. Forming a connection to any brand, including a college, is a nuanced, and often confusing, process with many components. 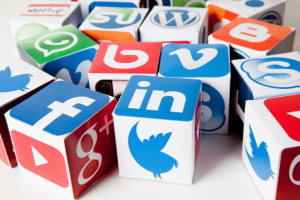 And, one of the most mystifying of those components today is the influence of social media and mass communications. 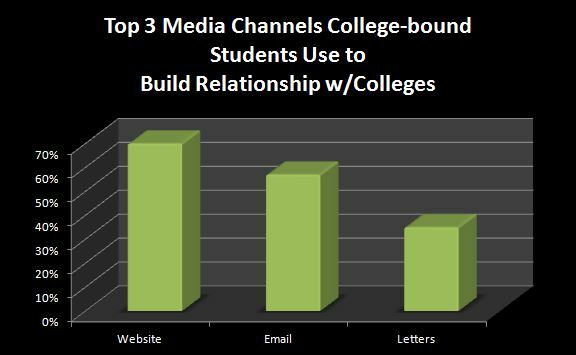 With our most recent national co-sponsored study, “Emotional Motivators,” we set out to bring some clarity to one of the top questions facing admission offices and college marketing departments today: Which communication channels are most effective in winning the hearts and minds of prospective students? We presented students with 16 channels to choose from (they could select any or all). Included in the list were: Facebook, Texting, Twitter, Snapchat, Email, Phone calls, YouTube, Instagram, Brochures, Letters/Postcards, Pinterest, Linkedin, College website, Mobile app, Live chat, and Personalized website. So, which are the top three? Does it truly enable students to see and feel what their life will be like at your school? Does it do this for differing groups of people? Does it connect them (emotionally) with current students on your campus? Is our website engaging? Does it create excitement? Do the visuals tell stories that will resonate with the students you are recruiting? Can prospective students and their parents find the answers to their questions easily? Is there a quick and easy way to make contact with an admission counselor? (You would be surprised how many college websites don’t provide admission counselor information.) Is there a photo and bio info for each counselor to make them more approachable for students? However, well-crafted, personalized emails can be very meaningful and can contribute in a very big way to building a bond between the student and college. Good news for the USPS, letters and postcards continue to be a compelling means to connect with prospective students. Like email, students respond best to personalized letters and cards. Many students said that humorous postcards actually help relieve stress during the college selection process. Today we are revealing the top three channels but we will share the complete list with you soon including some of the intriguing findings we have uncovered within each category. For instance, would you be surprised to learn that Instagram tested stronger than Facebook? With 800 million users engaging with the service on at least a monthly basis, and 500 million users daily, Instagram has quickly become a force in social media and prospective students tell us that it is more effective in building a bond with colleges than Facebook. If you can’t wait to see the entire list, click here and we will email the complete list to you. Our national studies explore many data points; variations between students in the deep funnel phase of recruitment, private/public college students, and males/females, just to name a few. Co-sponsoring institutions receive an even deeper view of their own pool of students. If you would like this information for your college, give me a call or shoot me an email. If I can help you with your recruiting efforts in any way, please feel free to call or email me. I would love to talk to you about our powerful and effective Yield Enhancement System (YES). Admission offices use this system to improve their mass communications efforts, have more effective one-on-one interactions, and ultimately, boost their yield. My contact information is at the bottom of this post. Continue the conversation on Twitter @LongmireCo. For more information about Longmire and Company’s Interactive Counselor Training Program, click here. Subscribe to Versions of Conversion today so you don’t miss any of this highly-valuable information.